PH0004983/243 - FIRST DEVON & CORNWALL LTD, THE RIDE, PLYMOUTH, PL9 7JT Variation Accepted: Operating between TORBAY HOSPITAL and TORQUAY MIDDLE WARBERRY ROAD given service number 64/65 effective from 31-Jan-2010. To amend Route. PH0004983/414 - FIRST DEVON & CORNWALL LTD, THE RIDE, PLYMOUTH, PL9 7JT Registration Accepted Starting Point: Paignton Finish Point: Torquay Via: Preston Service Number: X80/X81 Service Type: Normal Stopping Effective Date: 31-JAN-2010 Other Details: Every 30 Minutes Mon- sat 2 hourly Sunday & Public holidays. The detail behind the registration is now available so we can see what the changes are. The first thing I noticed is that the changes take affect from 24th January and not the 31st as per VOSA. 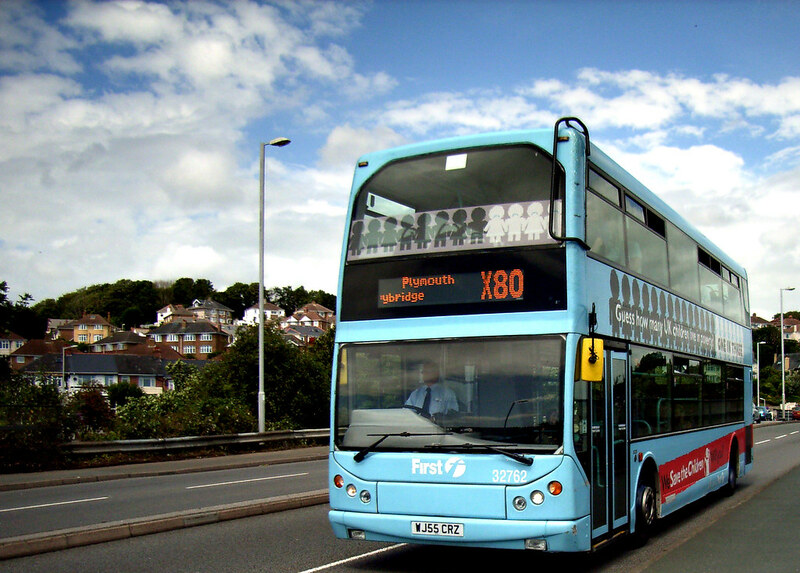 The new timetable sees most journeys split at Paignton, where you may have to change buses, mostly as a guaranteed connection. This is due to the pensioner free fares scheme which has seen many longer routes split into shorter sections. In the evenings the 20:05 Torquay to Plymouth service disappears completely but the 23:00 Torquay to Totnes bus is actually extended to Plymouth where it arrives at 00:30. This is no doubt due to the closure of the Totnes depot. The other direction now sees a new service departing from Plymouth at 06:00 arriving at Torquay at 07:45 where previously the first full run departed Plymouth at 07:00. This is also probably a side effect of closing Totnes. In the evenings we loose the full 18:10 bus from Plymouth to Torquay but gain a 17:55 short run to South Brent. The 18:35 departure from Plymouth also only goes as far as South Brent rather than Totnes as before. The last evening departure from Plymouth is now the 19:35 bus through to Torquay as the 23:05 Plymouth to Totnes bus is no longer as this would have been more of a positioning journey getting the bus back to Totnes depot which wont exist for much longer. Saturday is pretty much the same with a few minor changes but the same basic pattern as the Monday to Friday service. The Sunday service sees an extra morning bus from Plymouth at 08:17 to Torquay but we loose the last bus previously departing at 20:10 from Plymouth. Returning from Torquay we just loose the 22:00 Torquay to Totnes run. It does seem that these changes are more due to organisational measures around the closure of Totnes depot and the pensioner free fares scheme than anything else but there are really not that many changes to the basic timetable. Omnibuses: 2009 in 300 words. 10:13 All buses up and running today No weather related problems reported Dress up warm if you are going out shopping or just to enjoy the day off. 16:07 (fb) To keep right up to date with all service information, delays, diversions, etc, you can also follow Plymouth Citybus on Twitter. Get yourself set up with a Twitter account and then receive service information sent direct to your mobile phone whenever there is a problem. There are already 79 followers using this service to keep themselves up to date. There is also a cost saving element to the revised X80 timetable as journeys between Plymouth and Paignton fall outside of the scope of EU driving hours. Only services which run through to Torquay without an actual change of bus would still fall under EU rules. An inconvenience for passengers but a potential cost saving. This was the reason the Stagecoach's X45 only ran between Paignton and Plymouth. I was going to say, I would have thought it is being spilt to compley with EU regs. Some companies get round it by having two different routes, but which conviently interwork with the same bus. For example Stagecoach Hampshire's X64 (Winchester - Guildford) is now run as the X64 (Winchester - Alton) and the X65 (Alton - Guildford), except the same bus runs from Winchester to Guildford. It just changes route number at Alton.